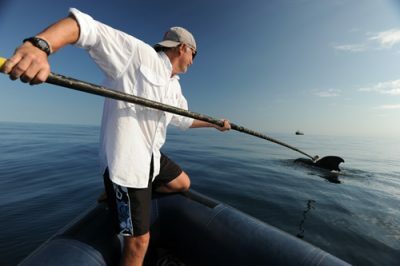 A scientist prepares to tag a pilot whale with a passive acoustic recording tag. Image courtesy of Ari Friedlander/NOAA. Passive acoustic recording tags allow scientists to essentially accompany a whale or other marine animal while it is underwater, hear what it hears, and observe natural behaviors otherwise hidden at depth. Acoustic and other data gathered are critical in understanding the behavior and ecology of many marine species. Data are also important in efforts focused on monitoring the response of marine mammals to sound while underwater. The first acoustic recording tags were applied to northern elephant seals in 1995. Since their advent, acoustic recording tags have advanced significantly and been deployed on many marine animals. Acoustic recording tags must be small, lightweight, pressure tolerant (especially if they are to be deployed on a deep diving species), and they must have substantial recording time. Tags can be attached with a long pole (and affixed via suction cups), shot from a gun or crossbow to be embedded in the skin or blubber layer of the target animal, or they can be glued directly onto an animal’s body. 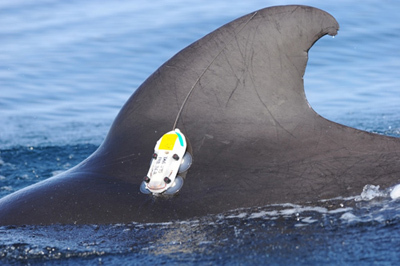 A digital acoustic recording tag developed by the Woods Hole Oceanographic Institution called the D-tag is a motion and acoustic recording tag attached to an animal (usually whales) by suction cups. The tag records not only the sounds of a tagged whale, but sounds from other whales, noises from boats (even distant ships), and all other sounds from various sound sources in the area. It also contains a digital compass, temperature sensor, pressure sensor (to measure dive depth), and a 3-axis accelerometer to measure the tagged animal’s orientation (pitch and roll). The D-tag’s ability to measure the animal’s orientation as a function of time allows scientists to measure the acoustic environment in tandem with physiological or behavioral information for the tagged animal. After a preprogrammed amount of time, the tag will release from the animal (if it has not fallen off on its own) and then float at the surface. 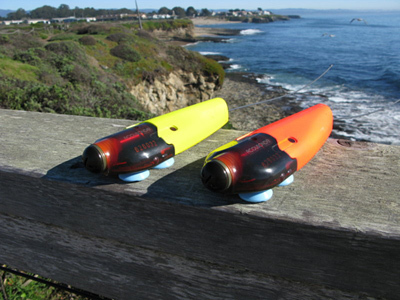 A small VHF radio beacon is attached to the tag so researchers can find it by tracing its radio signal. D-tags have been used to study many marine mammals such as humpback whales, North Atlantic right whales, sperm whales, pilot whales, blue whales, gray whales, Blainville’s beaked whales, and Cuvier’s beaked whales, as well as fur seals. Another miniature acoustic recording tag is the Acousonde, developed by scientists at Greenridge Sciences Inc. It has two acoustic channels each of which has its own hydrophone. The tag is also outfitted with a 3D accelerometer, 3D compass, depth transducer, and a temperature monitor. In addition to being used in behavioral studies on marine wildlife, the Acousounde can be used as an autonomous recorder suspended from a cable, placed on the seafloor, or housed in a robotic or remotely operated vehicle. Acousonde model 3B. Photo credit: Bill Burgess, Greeneridge Sciences, Inc.
Tyack, P. (2004). Run Deep, but Not Silent. Oceanus, 43(2). Winner, C., & Madin, K. (2010). Are Whales ‘Shouting’ to be Heard? Oceanus, 48(2), 8–9.